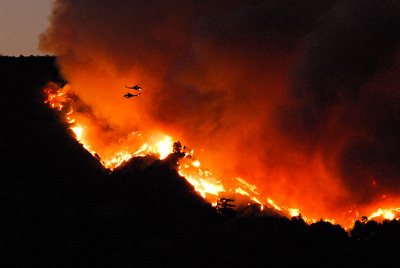 "I found out about the fire in Griffith Park, California after it was well underway," said Joshua Targownik. "I grabbed all of my gear, which is always packed and charged, and went to the roof of my apartment building. I spend five hours, until well past sunset, shooting and simply looking at the fire, just a few miles away." "I wanted to capture the color, ferocity, and the size of it all. I waited like a hunter for moments when planes or helicopters flew near the flames. I specifically snapped this one in the middle of a sequence of about five rapid shots." Joshua captured this compelling image with a Nikon D200, Action Grip head on tripod (allowed him to track aircraft well), 80-400mmVR @ 250mm, 1/60th @ f/5.6, -1ev, ISO 1600. Awesome shot, Joshua! Love it!